COMMENTS: FIND TRUE WISDOM AND COMPASSION. These are the treasures that lie at the center of your being, your 'Self'. You can empower yourself and your life NOW. YOU CAN achieve your life's dreams, and you can do it very surely and very quickly. Begin the journey to your 'center' and start to build your foundation for personal power. 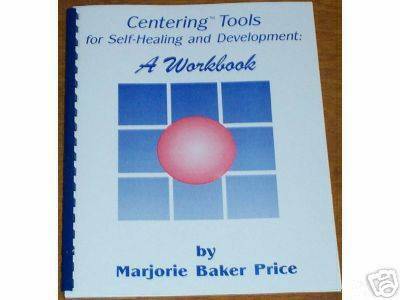 Marjorie Baker Price is here to guide you with her wonderfully simple, nationally acclaimed self-study workbook, 'CENTERING TOOLS FOR SELF-HEALING AND DEVELOPMENT'. Using her complete and easy-to-follow, inspirational guide, you will learn and achieve true healing. You will release past and present stressors, and find that you can create the realities you desire as if by magic. Most importantly, you will come to KNOW and ACCEPT yourself. This is the nature of true wisdom and compassion. Each chapter guides you through powerful transformational journaling and imagery into self-healing and spiritual development. The chapters along your centering path are signposts of immeasurable success in living: 'Freedom from Stress', 'Releasing the Past', 'Connecting With Your Higher Self', 'Clearing Blockages', 'Accepting and Loving Yourself', and 'Creating Your Own Future'. Don't wait. Begin imaging and journaling your way to your highest purpose, happiness and life's fulfillment. Workbook Cassette tape format. Buyers please add $4.05 shipping and handling in the United States. International shipping costs to be determined at time of purchase.